For some of us, the Force has awakened and for others, the Force has re-awakened. 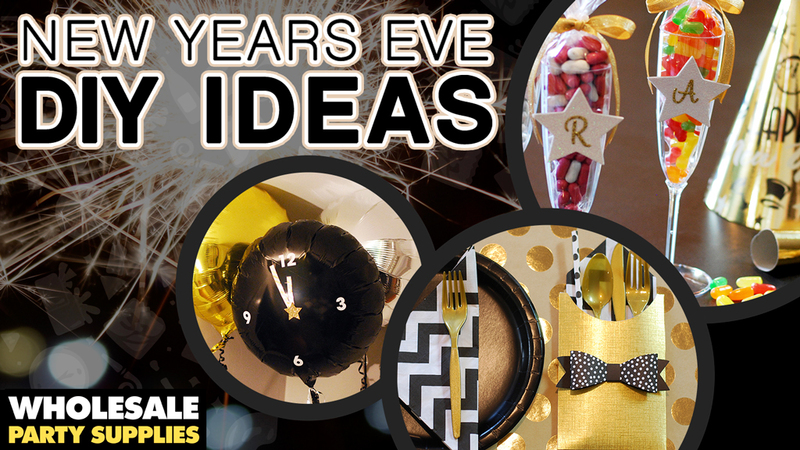 Whether you’re a padawan of the Star Wars franchise or have achieved Jedi master status, a themed party isn’t too far out in the galaxy for you. There is no try when you’re planning the perfect Star Wars: The Force Awakens party, only do. And the first step is to decide is your guest of honor more Jedi or Sith. Next, you’ll need a pinata from the opposing side of the interstellar spectrum to take down in the process. Looking for a way you can help fight the Dark Side? Well, let the Jedi in you shine as you bash the candy out of this Stormtrooper pinata. This DIY takes the term “bucketheads” to another level. 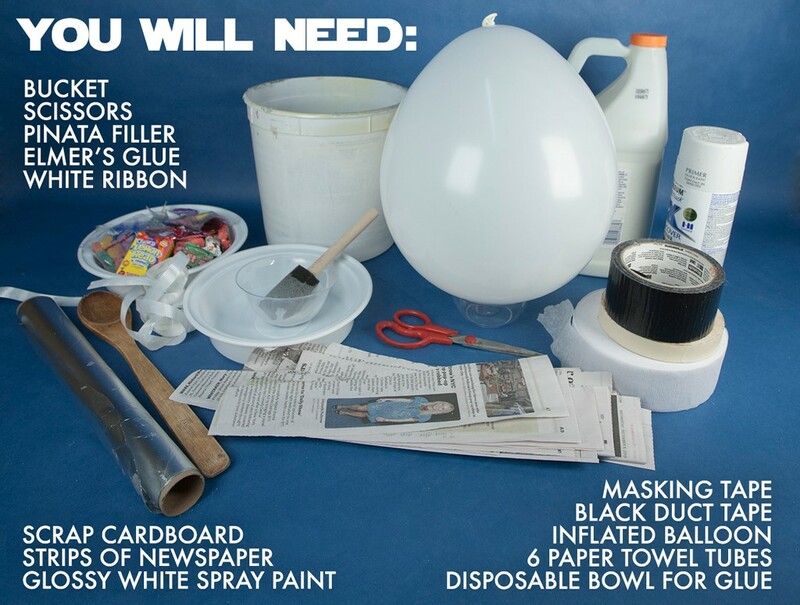 With a few supplies and some time, you’ll be able to create a pinata that will help your guests to use the Force to become the Jedi Knights you know they are! Step 1. Mix glue and water together in a ration of 3 parts glue and 1 part water. Mix thoroughly. Dip a strip of newspaper in the glue mixture, wiping excess glue off the paper. Step 2. Place the strip on the inflated balloon, gently pressing it flat. Step 3. Continue adding glue strips to the balloon, covering it completely. Add a few layers and let the balloon dry. Once dry, snip the end of the balloon open to deflate it. The sides of the paper might stick a little to the balloon, but you can stick the end of a wooden spoon in the top and gently pop the sides back out. Step 4. Turn the bucket over and cover it with aluminum foil. Start covering the bucket in newspaper strips. Step 5. Finish covering the bucket with a few layers the strips and let dry. 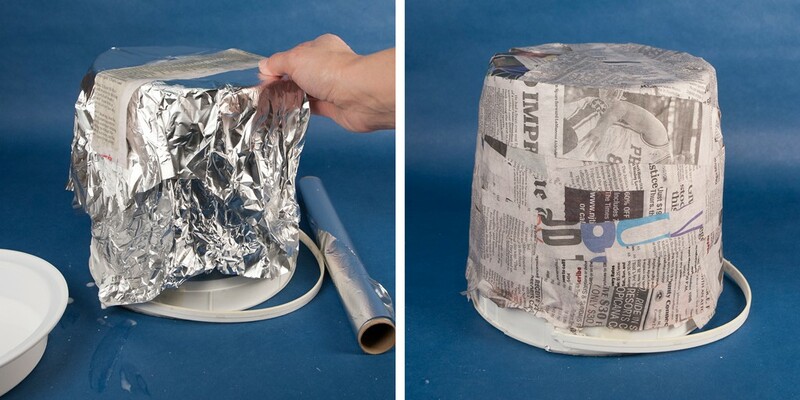 When the paper is dry, remove from the bucket and peel off the foil. Step 6. Cut the top off the balloon, about 4-5” down. Use the scissors to gently cut a slit in the bottom of the balloon. Step 7. Fold a piece of ribbon in half and cut a little longer than the length you want for hanging. Insert the open ends through the hole in the balloon shape, as shown. Step 8. Securely tape the ends inside of the balloon using masking tape. Step 9. Place the open end of the balloon over the closed end of the bucket shape. Press it down to form the basic shape of the helmet. Tape the pieces together. Step 10. Carefully tape the paper towel tubes around the base of the helmet. The tubes will not lay entirely flat against the helmet, so use plenty of tape to hold them in place. Step 11. For the front of the helmet, add a second set of tubes. Tape smaller pieces of tube to the left and right sides, as shown. Step 12. Your piece should look similar to ours from the bottom. You will have a nice size opening for the candy. Step 13. Trace the bottom of your helmet on a piece of cardboard, and cut it out. Cut a door in the bottom of the cardboard, to use to add candy. Tape the card board to the base of the helmet. Step 14. Mix up more glue and water. Add larger paper strips to the helmet to cover the tubes, and create the flared look of the mask. Make sure to wrap paper strips around the edges of base, so it will be firmly attached. Step 15. Finish covering the whole helmet and let dry. Step 16. Spray paint the helmet glossy white. It might take 2 coats of paint to thoroughly cover it. Step 17. Cut or rip a strip of black duct tape and place it across the front of the helmet where the visor would start. Step 18. Finish the design of the visor. Work in small pieces, and lightly place the duct tape, so that you can easily move it around before pressing it down. Optional– We prefer the glossy look of the helmet, but you can always glue on white crepe paper for more of a traditional pinata look. Step 1. 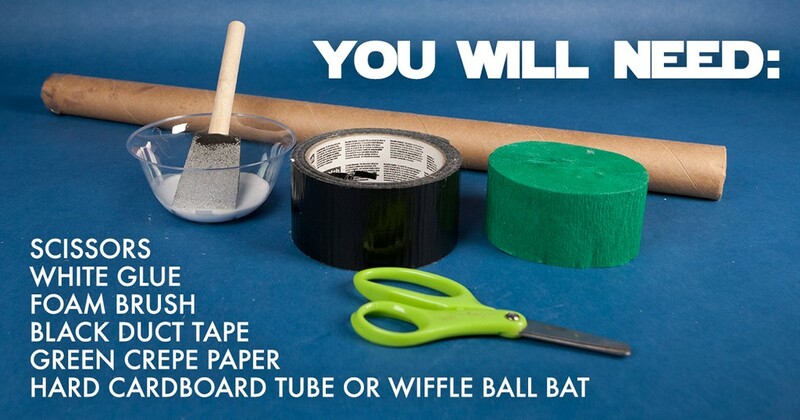 To create the handle of the light saber, wrap one end of the tube with the black duct tape. Step 2. Cut a long piece of crepe paper, and fold in half multiple times. Cut slits in the crepe paper, about ¾ of the way through, as shown. Step 3. Brush glue on the tube, starting above the handle. Step 4. 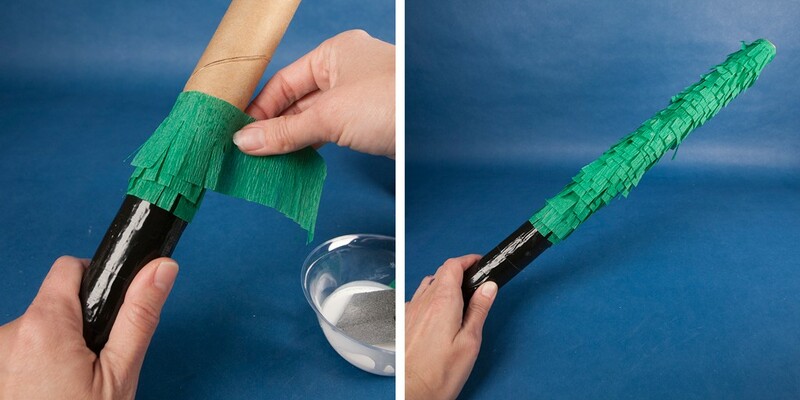 Wrap the cut crepe paper around the tube. Step 5. Cover the remainder of the tube with the cut crepe paper. 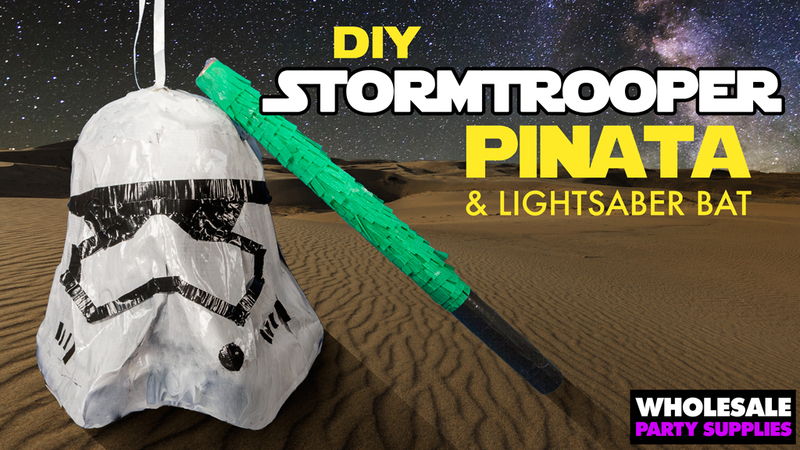 The light saber is the perfect weapon to use against our DIY storm trooper pinata. You’re our only hope when it comes to planning a party epic enough to awaken the Force! If you recreate this DIY pinata for your Star Wars themed party, we want to see! Be sure to share it with us on Facebook, Twitter or Instagram and may the Force be with you all! We made this Pinnable guide for your Star Wars Party boards.